Each offseason, MiLB.com goes position by position across each system and honors the players -- regardless of age or prospect status -- who had the best seasons in their organization. Click here to locate your favorite club. The Giants improved at the Major League level after a 64-win season in 2017, but they still finished 18.5 games out of first place. The losing seeped into the Minor Leagues, with the organization's full-season affiliates finishing a total of 67 games under .500. Despite having only two Top 100 prospects and a 55-win Triple-A team, there are reasons to think San Francisco's farm system could be on the rise. It starts with the performance of several players at Class A Short Season Salem-Keizer, including the team's potential heir apparent to perennial All-Star catcher Buster Posey. Catcher -- Joey Bart, Salem-Keizer (45 games), AZL Giants Orange (six games): The sample was certainly small, but the early returns on this year's No. 2 overall pick were impressive. Bart made his presence felt immediately upon arriving in Salem-Keizer, blasting two homers in his debut with the team and six in his first seven games. Although he cooled off from there -- it's difficult for any player to maintain a slugging percentage over .900 -- but he batted .298 with a .952 OPS with 13 homers for the Volcanoes and should begin 2019 with a full-season affiliate. "He did a little bit of everything. ... I don't see another system that has a catcher who produced quite like he did, even if only for a half-season," Giants assistant director of player development and instruction Kyle Haines said. "Joey is obviously a leader both behind the plate and in the box, impressive in all areas -- offense, defense, power, leadership abilities. He was the total package for us this year." First baseman -- Jerry Sands, Richmond (78 games), Sacramento (22 games): The 31-year-old is the definition of a journeyman, but Sands put up a stellar .269/.361/.505 batting line with 16 home runs as organizational depth in San Francisco until the first week of August, when he was released to pursue an opportunity with the Nexen Heroes in Korea. Second baseman -- Kyle McPherson, Salem-Keizer (65 games), Augusta (one game): McPherson struggled in his limited 2017 debut but put forth an impressive 2018 campaign. tying for second in the Northwest League with 49 runs scored and ranking third with 33 extra-base hits while finishing just outside the top five in average (.314), on-base percentage (.370) and slugging percentage (.493). He was also consistent, batting at least .290 with a .790 OPS in June, July and August. "We knew he could hit. If you look at his college career, he's hit," Haines said. "He went to Salem, kept hitting and got better as the summer went on. His ability to produce extra-base hits and get on and use his speed on the bases set the table for the offense, which produced very well. He was the catalyst. Defensively, he improved a ton, and I think he's a sleeper for us to be an offensive-minded second baseman." 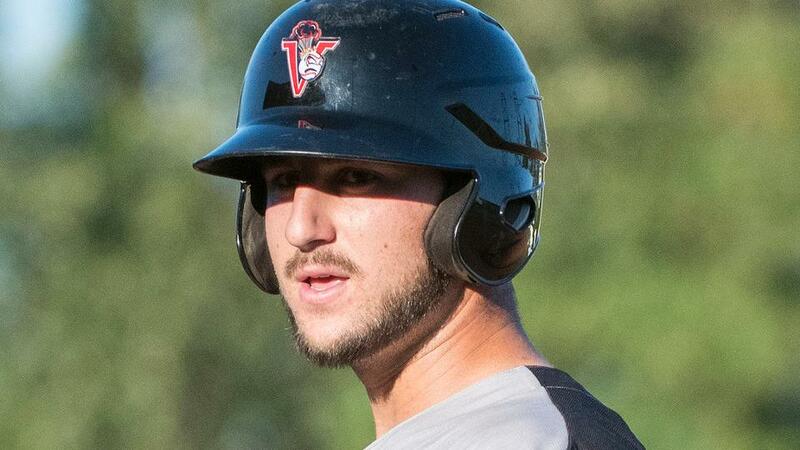 Third baseman -- David Villar, Salem-Keizer (56 games), AZL Giants Black (six games): One of the two Northwest League players who finished above McPherson in extra-base hits was Villar, who led the circuit with 35 extra-base hits (22 doubles, 13 home runs). He ranked third with a .549 slugging percentage behind only fellow 2018 draftee Bart and Spokane's Curtis Terry after an impressive college career at South Florida. "He was a guy we were surprised dropped to us in the 11th round," Haines said. "He came out and kept hitting and has plus defensive ability at third base. He has power and a right-center-field approach, which fits in his profile really well. Good glove at third, good throwing arm and put together a really good year and really caught our eye. He's probably going to be a fast mover for us." Shortstop -- Chase d'Arnaud, Sacramento (76 games), San Francisco (42 games): Despite entering the season with nearly 200 games of big league experience, d'Arnaud hadn't posted an OPS over .800 in the Minors since 2009. The 31-year-old enjoyed a banner season in the Pacific Coast League, producing a .292/.393/.522 slash line with 12 home runs and 15 stolen bases before earning a promotion to San Francisco in early July. "He hit for more power this year than he ever hit for after he made some offseason swing adjustments," Haines said. "A good runner and good athlete who has defensive versatility, did a solid job at shortstop and earned himself another shot in the bigs and got a hot start there." Honorable mention: Ryan Howard, Richmond (117 games): While his numbers weren't overly impressive, Howard's .273/.336/.396 slash line in the Double-A Eastern League closely resembled his 2017 numbers in the hitter-friendly California League despite a 33-point dip in his average. In 90 fewer plate appearances, Howard nearly doubled his walk total from 23 to 39 and cut his strikeout rate by nearly 20 percent. "In a pitchers' park and pitchers' league, his walk rate and his plate discipline improved," Haines said. "He put together a really solid year." Chris Shaw, Sacramento (101 games), San Francisco (22 games): Shaw continued to display his 60-grade power with his third consecutive 20-homer season, and his .505 slugging percentage ranked just outside the top 10 in the Pacific Coast League. He also improved his range in left field enough to earn a September callup. "Everybody's always going to talk about his special power, [but he had] incredible improvement on his defense in left field," Haines said. "He basically was new to it last season [and it] was rough, but this year he put that to rest and showed he can play an average left field and give his bat a chance to be a productive Major League player. He showed the power in Triple-A and was the centerpiece of that offense in Sacramento." Heath Quinn, San Jose (96 games): Quinn's Cal League debut was a struggle in 2017, but he bounced back in a big way this season. His slash line improved from .228/.290/.371 to .300/.376/.485, he cut his strikeout rate by almost 5 percent and improved his walk rate by over 50 percent. He was sidelined for a month after hurting his leg in early May, but didn't miss a beat upon returning with four multi-hit games in his first five games. "Heath had a very well-rounded year the whole year. [The injury] hurt his ability to get out on defense as much as we liked, [but he] repeated the year he had in the NWL [in 2016] in the Cal League," Haines said. "It was nice to see him produce this year, especially on the offensive end. He has good plate discipline and hits for average, and his power should develop down the road. He'll give you some value on defense as well." Austin Slater, Sacramento (53 games), San Francisco (74 games): Slater didn't play in Triple-A past June, but he was so good for the River Cats that he coerced the Giants to bring him to the Majors. If he had enough at-bats to qualify, his .981 OPS would've ranked second in the PCL behind Fresno's Kyle Tucker and his .344 average would've topped the circuit. It's easy to argue Slater was one of the league's top hitters in the first half. "Slater had an amazing year in Triple-A, just forced himself into the big leagues," Haines said. "[He has the] ability to get on base, drive the ball and play great defense. He's a good runner for a corner outfielder, can play center and draw walks. Seemed to have a knack for the big hit and did a little bit of everything." Utility player -- Wander Franco, Salem-Keizer (56 games): Signed as a Minor League free agent in April, Franco split his time between first base (31 games) and third (15 games) this season and hit .314/.351/.519 with five homers. He struck out 41 times in 210 at-bats compared to 78 whiffs in 272 at-bats at Class A Quad Cities last season, and while the bump down in level helped, the 22-year-old's future looks much brighter than it did a year ago. "He's a doubles machine and probably will hit more homers as he plays more and gets more at-bats," Haines said. "He's got good hands and a good throwing arm, and we're trying to make him more versatile. Filled in at first and third just to get his bat in and was really a very pleasant surprise for us. When the Astros released him, we thought we saw something, and he forced us to play him more." Right-handed starter -- Shaun Anderson, Richmond (17 games, 16 starts), Sacramento (eight games, eight starts): Anderson needed just under four months at Double-A to prove he was ready for a new challenge, and he held his own at Triple-A. He posted a 34-to-11 strikeout-to-walk ratio with the RiverCats, and a 4.18 ERA in his first taste of the PCL gave him something to build on. He allowed three or fewer runs in six of his eight starts in Sacramento. "Shaun's real close to the big leagues. He proved that in Double-A this year and went up to Triple-A and did a great job in a league tough on pitchers," Haines said. "Did a little bit of everything, plus [he's a] competitor, nobody's going to outwork him. It was nice to see him put all four pitches together and produce a good year." Left-handed starter -- John Gavin, Augusta (20 games, 20 starts), San Jose (six games, six starts): Gavin won only six games, but with a 2.87 ERA and .195 average against, it's not really his fault. His 139 strikeouts ranked second in the organization behind fellow southpaw Conner Menez, and he posted a walk rate under 3.5 walks per nine innings in his first full season after being drafted in the eighth round out of Cal State Fullerton in 2017. "He did outstanding there in the South Atlantic League in his first full season," Haines said. "A very polished lefty with surprisingly good stuff -- not a soft-throwing lefty. Got some life on his fastball and was able to use that to his advantage when he was able to command his fastball, throwing strikes, competing and able to get deep in the game. We're excited about where he's going to go in the future and maybe surprise some people." Relief pitcher -- Camilo Doval, Augusta (44 games): Doval's 0-3 record and 3.06 ERA don't stand out, but his 78 strikeouts in 53 innings gave him easily the highest strikeout rate among relievers in the system. The 21-year-old right-hander allowed seven runs in his first two appearances, but was lights-out after with a 1.87 ERA in his final 42 appearances. "His first two outings were miserable, because he was scared to pitch in front of people, then he settled in and dominated," Haines said. "Right from Rookie to low-A and had never pitched in a stadium in front of people. Once he got jitters out of the way, he was dominant. You're looking at a fastball up to 99 [mph] and a plus breaking ball. He's a guy who gets a ton of swing-and-miss." Chris Tripodi is a producer for MiLB.com. Follow him on Twitter @christripodi. This story was not subject to the approval of the National Association of Professional Baseball Leagues or its clubs.